Extreme Weather Apparel. This year, experts are predicting an extremely intense storm season. We're ready. Frabill introduces the all-new F-Series Storm Gear designed to defend against the most severe elements. A comprehensive update to Frabill's current award-winning line-up, the F-Series provides enhanced wind and rain protection along with numerous design advancements. Improved water resistance, advanced ergonomics and a three-way adjustable hood and visor ensure you're ready to take the lake by storm. F3 Gale Jacket Features: Three Layer Waterproof, windproof, breathable shell - 330 denier nylon. 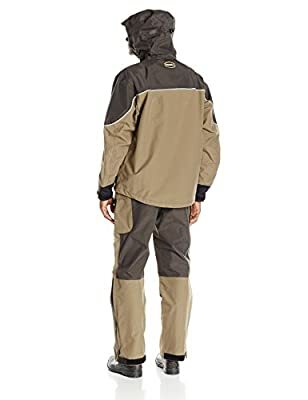 Waterproof, windproof and breathable membrane 100% seam sealed. Two - way adjustable, waterproof hood with reinforced brim/sun visor, Water resistant external zippers, Ergonomic curved sleeves, Adjustable sleeve cuffs plus internal waterproof StormCuff, Adjustable bungee cord at hem, Chest D-rings to attach tools and side seam D-ring for tether cord kill switch, 3M Scotchlite Reflective Material on front, sides and back.